British pianist Veryan Weston performs “Tessellations,” a composition for solo piano. Stucturally, the work is inspired by and resembles some of the principles of geometric tessellations – repeated, non-overlapping shapes that create infinite patterns (think of artworks by M.C. Escher). In this work, visual interlocking symmetries and geometric shapes are transferred to the audible world of pitches, rhythm and counterpoint, with the spirit and energy of jazz, improvisation and folk music always at the heart of the performance. The piece contains a sequence of 52 closely linked pentatonic scales. Each scale has two pre-established areas in which ideas for improvisations can be developed. 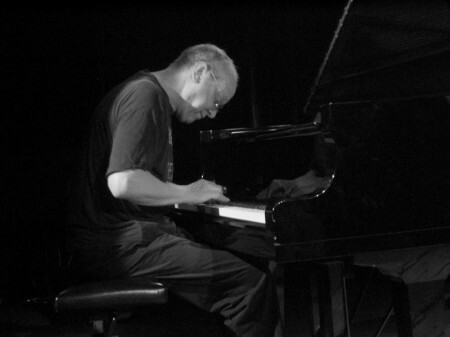 The piece is continuous, so the player and listeners take part in a journey that lasts about one hour – a pianistic tour de force in the tradition of Tom Johnson’s “An Hour for Piano” or Rzewski’s “The People United Will Never Be Defeated.” Although tonight he will be performing it on a regular baby grand, “Tessellations” was originally performed on the presumed last Luthéal piano in existence. First built in 1914, the Luthéal piano uses organ-like stops to move small quills and pieces of felt into close proximity to the strings, producing timbres similar to those of harps, harpsichords and Hungarian cimbaloms. This can be heard on the CD, released by the EMANEM label. Veryan Weston (b. 1950) moved to London from Cornwall in 1972 and began playing as a freelance jazz pianist as well as developing as an improvisor at the Little Theatre Club. He accepted a fellowship with the Digswell Arts Trust in Hertfordshire in 1975 who commissioned him to revise his book on piano improvisation. During this time he co-founded and composed for the group Stinky Winkles. Whilst at Digswell, he collaborated with visual artists, and also composed and performed music for a range of films and documentaries, most notably with saxophonist Lol Coxhill for Derek Jarman’s Carravaggio (1985). Throughout the 1980s and early 90s he worked primarily with the Eddie Prévost Quartet, Trevor Watts’ Moiré Music, and duets with Lol Coxhill and vocalist Phil Minton. He also worked in other ensemble projects with Minton, including a quartet with saxophonist John Butcher and percussionist Roger Turner. Major festivals have included Zurich, Berlin, Nicholsdorf, Karlsruhr, Warsaw, Wroklaw, San Sebastian, Bombay, Vancouver, St Etienne, Aukland, Nevers, Washington, Lille, Houston, Le Mans, Straasbourg and Victoriaville.